How did she find me hiding in here? Last week King Spitty complained about how narrow his window sill was. 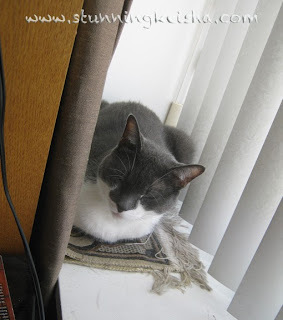 I commented that not only was mine wide—just like TW—but I had my own prayer rug to lay on while I watched Bird-tv. In fact, I have two prayer rugs. One is green and one is beige. Right now, I'm availing myself of the beige one. TW bought them a hunnert years ago at some Going Out of Business Sale. But that's really TMI. What's neat about the location of the rug is that it's hidden behind a piece of furniture so I can be alone with my thoughts. Recently Spitty axed me Do you pray to Ceiling Cat on it? Is it comfy? Dear Bast. Please send me a bird. Amen. 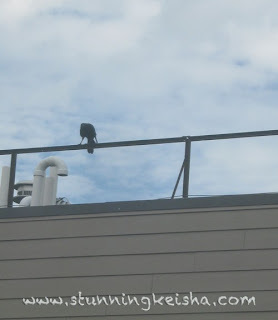 A BIRD! My prayers have been answered. 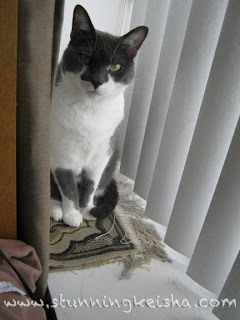 In answer to Spitty's questions: When I'm on the prayer rug, I expect others to worship me. Yes, my rugs are very comfy. Dear Bast. Please send me a million dollars. Amen. You still have time to enter the drawing for a $15 gift card to CrystalsandJewelry.com. Just leave a comment here and tell me what your favorite stone or crystal is. For extra entries Like my new Stunning Keisha FB page, Like CrystalsAndJewelry.com on Facebook, Twitter and Pinterest and tell me in a comment that you have done so. This giveaway will end on July 13 at which time I'll pick a winner. Right now Robyn's huge summer break sale is going on. 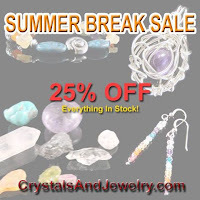 Everything in stock is 25% off until July 15th PLUS she's offering readers of this blog a $5 off coupon with a minimum order of $9.95. Just use coupon code HRBBM4QWN. First Class Shipping via USPS within the United State is free. LOL we are sure everyone worships you Keisha, you who is so stunning. Have a serene Sunday. You do look stunning on your rug CK! Hey, I've got a couple of rugs here too so I'll have to try the million dollar thing! We certainly hope that everyone worships you the way that a stunning cat deserves! Does the praying for birds thing work, because those huge birds behind our house would be pawesome if we could just get them inside. Well your window sill does look pretty comfy and accommodating. I catch my baby sitting on the ones in my bedroom sometimes. I wonder if she's part cat. What great accommodations you have for bird tv with the prayer rug and wide window. Bast was good with providing birdie tv. It's always good to have a place to hide away and think. Those prayer rugs sound pawsome. We have lots of window sills, but nothing comfy on them. I think I have to have a talk with mom! Lucky you, CK! We don't even have ledges for our windows - NO room at all to sit, much less have a prayer rug. That looks like Jeanie's magic carpet. I think if you wish hard enough, you might be able to fly on it! We need us one of those prayer rug! Though we don't have a window sill to sit on. Hmm. You have such a great space for asking (errr, demanding?) that your wishes be granted. And so far, so good! That's a perfect window sill for a kitty! And the rug makes it even more kitty friendly! Awesome! Don't forget to pray for some privacy too! You should be untouchable and unseeable on your rug. Doesn't TW know that? Now that's channeling the Law of Attraction! Bet that million is on it's way! CK, you could pray for some privacy, too! Of course, you are right about others worshiping you rather than vice versa. What could I have been thinking?!? About the Whiskas...the Human agrees with TW that Whiskas is junk food, but I was (and sort of still am) SUCH a picky eater, she lets me have whatever I will eat. She managed to switch me over to healthier kibble (Royal Canin) but so far the higher-quality canned food is a bust. She just tried again last week, and ended up scraping that $1.19 can of foor just about straight into the trash (I ate one test-bite before I walked away). Sigh. Does TW think Fancy Feast is better? Cause I will eat some FF flavors. The Human had sort of thought they were about the same, but if FF is better she can try harder to switch me over. Your window sill is indeed very wide and the rug makes it even comfier! And prayers on that rug seem to be answered promptly. How cool! I want to receive dollars too!!! Wow! I need a prayer rug, too. I can't believe you got a bird just like that! So impressed. Love your bloggy. It's wonderpurr! That prayer rug looks quite amazing~! 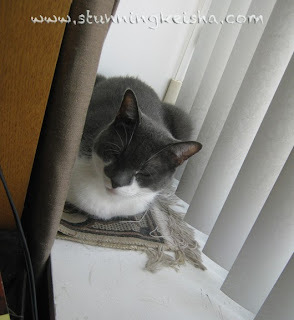 The prayer rug looks purrfect with you on it , CK !